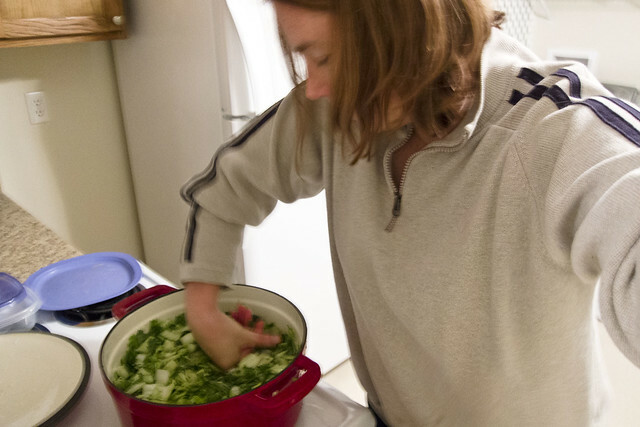 Due to the large amount of cabbage we currently have, I finally decided to make the sauerkraut. I debated on what kind of receptacle to use, finally deciding to use the large dutch oven I bought Chris for Christmas. Apparently there are fermenting crocks one can buy, and perhaps if I make sauerkraut in the future after this initial experiment I will buy one. For now the dutch oven will work. 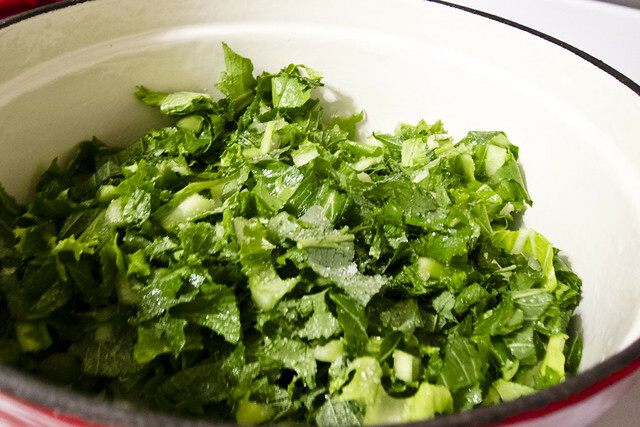 I alternated between chopping up the cabbage, rinsing it and then layering it in the dutch oven, sprinkling it thoroughly with salt on each layer. The salt assist with drawing out the water from the cabbage. I went by Wild Fermentation’s directions but there are many directions on Google and it seems that you can do it in many methods, including a glass jar—another option I might try next time. Once I had all the layers I went through and packed it down. This also helps with crunching some of the water out. Yes, really bad self portrait, but I’m all about the action! 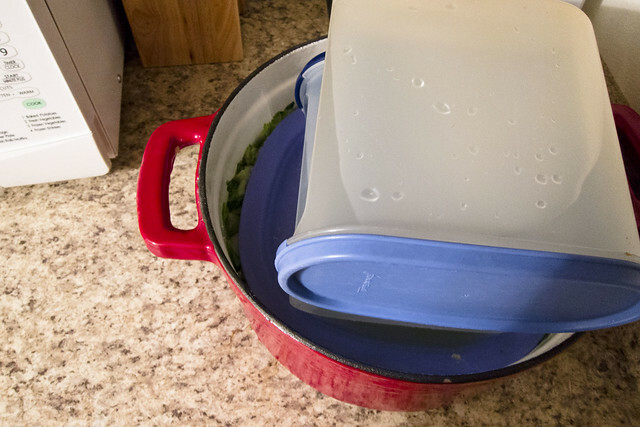 I looked for awhile for a weight to keep the plate down and opted for some Tupperware filled with water. I already took one off as the water have risen enough that only one was needed. 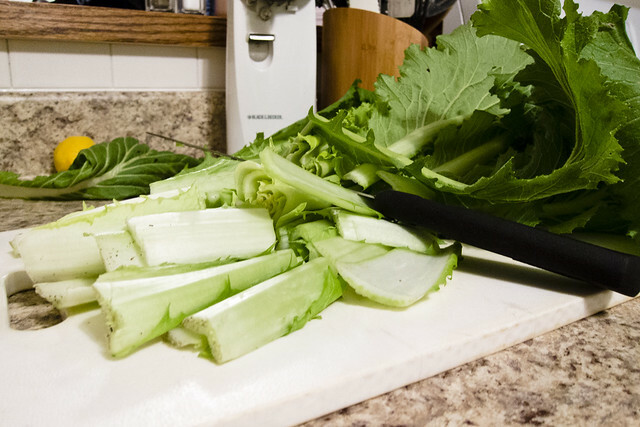 The plate keeps the cabbage packed down and the weight works to raise the water level in the crock. The water will slowly evaporate and I’m supposed to replace it with a salty mix of water in order to keep it all covered. Currently it is covered with a cloth and tucked onto a corner of my kitchen that I don’t use too often. I’ll keep checking it every few days, looking for mold to skim off and to see about refilling with water. I’ll probably do a weekly Fermentation check so you can see how the process is going! Hopefully in 2-4 weeks I’ll have something good to eat! I had no idea that’s the way it was done. Updates as you go! I made sauerkraut like that last year, but I think I missed a step along the way. I ended up with salty and not at all sour kraut. I can’t wait to see/hear how yours goes, I’m ready to try again!